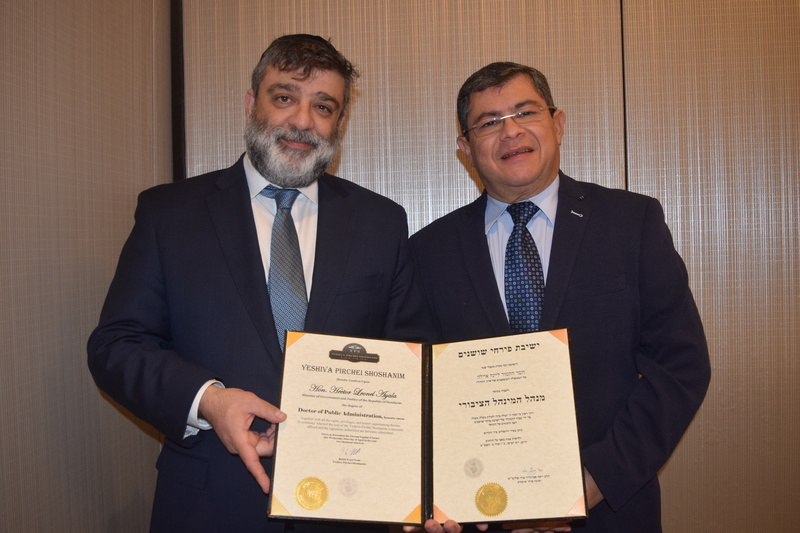 Rockland County, NY - An effort to expand the production of kosher certified ingredients in Honduras in order to stimulate the republic’s economy has brought with it the creation of an official chief rabbinate which will be headed by a Monsey rabbi. Rabbi Aaron Lankry, spiritual leader of Bais Medrash Ohr Chaim in Forshay, will be serving as the first chief rabbi of Honduras, a country which currently does not have any religious Jews. At a Wednesday meeting at the Sheraton Crossroads in Mahwah convened to draw business to Honduras, Honduran Minister of Government and Justice Hector Leon Ayala said that it was an honor for the country to create the new office. “This is the first time that Honduras is recognizing a chief rabbi and we are 100 percent willing and able to do so following the national oath of the Republic of Honduras,” Ayala told VIN News. The idea to create a chief rabbinate was sparked by an economic interest, explained Jay Bar-Levy, who works closely with Rabbi Lankry in Monsey. Having a chief rabbi in the republic would create the possibility of Honduran food items becoming kosher certified which could potentially increase exports, said Bar Levy. Rabbi Lankry plans to work with the large number of Hondurans who believe that they are descendants of those who practiced Judaism secretly during the Spanish Inquisition. According to Rabbi Lankry, the dwindling presence of Christianity in Honduras has left a religious void that is being filled by Muslims, prompting many who believe that they might be Jewish to start exploring their own religious roots. Rabbi Lankry noted that those who discover that they are not Jewish could undergo an Orthodox conversion if their desire is sincere and all of the necessary religious criteria are met. Rabbi Lankry said that he has yet to visit Honduras and that he looked forward to exploring various opportunities to build economic and other bridges between the republic and the State of Israel. Other new initiatives launched include a Honduras and Israeli Chamber of Commerce and commercial government offices to be located in Jerusalem, New York and Tegucigalpa. Wow. Does the rav speak Spanish ? Lol he's being made chief rabbi of a country he's never been to. Sounds like some askan using pull to get him a monopoly on the hechsher business. Shades of a Milan born erican chabadnik become chief rabbi of Russia. While the term "Marrano" is widely used, quite a few members of that community consider it disparaging. To quote from WIkipedia (yeah, I know, but other places have similar comments: "In modern use "marrano" is sometimes, but not always, considered offensive; and "crypto-Jew" is occasionally preferred in scholarly works." Rabbi Lankry is after $$$. That's it. This is merely a devious money grab to monopolize all hashgacha on the island. He convinced them with the farcical argument that he'll increase kosher business there... once he's appointed the Chief Rabbi, any factories in the country will be forced to pay him off for sanctioning their products. Why does this article play into his phony narrative??? Finally. Enough racketeering by fake rabbis like moshe otero and meir amram that go around taking money from wannabe converts and then leave. Agree. He is Stam a לץ. I heard him once at a shabbaton. Rather baffling there are plenty of countries where kosher production takes place without having an established Jewish community. The major certification agencies frequently travel around the world. Why on earth would you need to call someone chief rabbi?